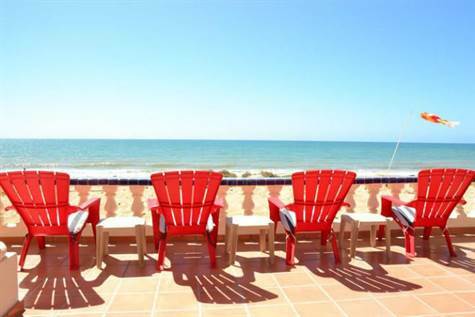 Las Gaviotas, Sandy Beach - Ocean front condo located on Sandy Beach in the popular Las Gaviotas. Best location and best price. A great combination for those who want to own on the beach. Location, views and priced right! Playa La Jolla, East Beach - The private development of Bella Vita is part of the beautiful Playa La Jolla gated seaside community. 70 B is a 2 bedroom, 2 bathroom single story bungalow featuring 9 foot ceilings, recessed lighting and a boveda ceiling feature in the living room area. This richly furnished bungalow offers neutral tones giving you the opportunity to add your favorite splash of color. Granite counter tops and custom sinks add to the ambiance of this unique piece of paradise by the sea. With easy access to a common roof top terrace there are amazing ocean views. 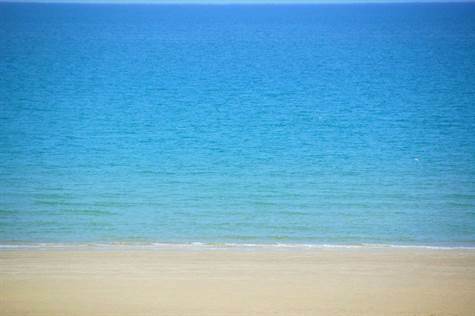 You’ll enjoy the pristine beach between the Sea of Cortez and the Morua Estuary perfect for all your beach activities. It is one of Rocky Point’s finest beaches. Please call for a private tour of Bella Vita 70 B and enjoy the well appointed bungalow and surrounding grounds. Villa Cortez, Playa La Jolla - Ocean view 3 bedroom 2 and a half bathrooms in charming La Bella Vita has a special ''glad you're here'' feeling. With a open floor plan, cozy corner fireplace, custom paint and granite counter it has quality in every room. Beamed ceilings and sliding glass doors to the patio and balcony add to the ambiance of Villa 18. The large margarita deck is perfection for ocean viewing and entertaining family and friends at your hideaway by the sea in Puerta Penasco, Mexico. Features include: Fans throughout Custom tile Laundry room with stacked washer and dryer. Playa Encanto, East Beach - Seller Financing with 25% Down. Bungalow style beach getaway. Second row, 2 bedroom , 2 bath with an open floor plan offers amazing ocean views from the custom tiled balcony, kitchen and great room area. The kitchen has colorful Mexican style decor with custom tile. High beamed ceilings add to the open feeling of this fun property. Both bedrooms have 2 double beds perfect for a family. They also have built in closets and storage space. There is a fun beach feeling throughout and it is only steps to the pristine Playa Encanto beach. Life is better in flip flops. Call us for a tour and see this unique vacation destination. The sunsets are vibrant from a balcony you will want to return to again and again. Under LLC with minimum closing costs. 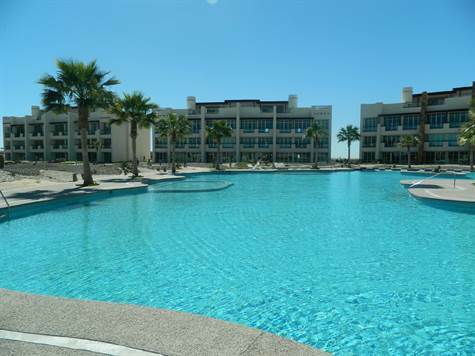 Mayan Palace, Puerto Penasco/Rocky Point - Furnished 2 bedroom 2 bath condo with amazing pools, located in the Mayan Lakes at the Mayan Palace, home of the new international airport. Includes 1,349 sq ft living space, 1 master suite up front with long front patio for entertaining or relaxing and views to the pool. Other bedroom faces the estuary. Stainless steel appliances and granite countertops. Hot tub and bar area on rooftop for enjoyment and sunset entertaining. Mayan Lakes has one of the best sandy beaches with no rocks. Also includes access to all of the Mayan Palace amenities. Jack Nicklaus signature golf course on site with special golf rates for owners. • 2,857 sq. ft., 2 bath, 4 bdrm single story - MLS $269,000 - Amazing Value! Laguna Shores, Black Mountain - Beautiful home, beautifully furnished, in a beautiful location in a 1st class community! The great curb appeal hints at what is inside. Broad entry invites you to the main living area, which features the great room concept. Over 500 sf of living room adjoins the dining area with granite dining table which adjoins kitchen, with space for the chef and all the sous chefs. Perfect for entertaining! Step outside to covered patio adjoining beautifully landscaped back yard, then step up the stairs to 2,160 square feet of rooftop margarita deck with sweeping sea and desert mountain views. There is room for all - master suite with compartment bath and large walk-in closet is separated in split bedroom floorplan from 3 more spacious bedrooms, each with large closet with built-in's. Quality construction, impeccable maintenance, and the finest finishes, plus paved streets, water & sewer, outstanding security, and some of the most beautiful beaches anywhere, plus the many amenities offered by master-planned Laguna Shores, add up to make this a very desirable property. San Rafael Ejido, In Town - Looking for an investment? 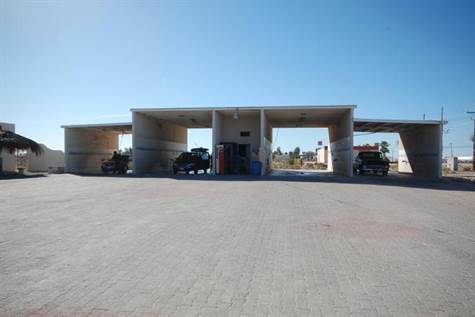 Here is an opportunity to own an easy to manage investment business in Rocky Point, Mexico. AND an open area for additional storage you can develop. This is a well trafficked area on Blvd. Juarez. It is currently open 24 hours a day. Find a partner and invest in this prime property in Rocky Point. The possibilities are limitless. 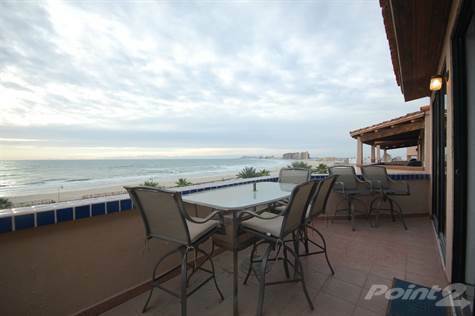 Los Portales, Playa Encanto - DREAM OF A LIFETIME BEACHFRONT HOME ON ONE OF PUERTO PENASCO’S PRISTINE BEACHES IS WAITING FOR YOU! With forever ocean views you’ll be living in paradise enjoying the good life from the moment you walk through the doors. The negative edge pool and Jacuzzi look out to the beautiful beach and ocean. A fantastic covered patio with built in tables and grill area are exceptional for entertaining family and friends. A one of a kind custom built home it is quality through and through. The gourmet kitchen offers ample room for the family to gather around the granite counter and be part of the cooking adventure. The rich paint adds to the warmth of the home and gives you a feeling of comfort. A fun game room is perfect for all ages and the TV room is too! This home is one you'll love returning to again and again. 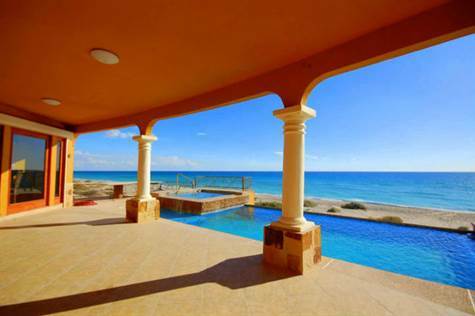 Las Conchas, Puerto Penasco/Rocky Point - Located in one of the most popular beach front gated communities Las Conchas Sec 5 lot 20 is now on the market. Sec 5 has what many consider the best beach in all of Rocky Point. This home full of amazing memories is ready for a new family to build the stories that last a life time. From the moment you walk in the door the views of the sea of cortez stop you for a second... even if you have seen it a million times this home has views that are something special. 3 bedrooms 3 bathrooms with a large open kitchen and living area with 3 sets of sliders to the patio each giving you the view we all dream of... it is hard to not see what could be. All bedrooms face the ocean with the Master and guest bedroom on the main floor. Down stairs is a large open 3rd bedroom with a separate access to the beach. Take a look and call now. With one outstanding layout, 2 beachfront patios, fully furnished, large lot giving you more than twice the average square footage of land.... call now! Home sits on two lots. Separate living quarters for a maid, staff or guests. Perfect for a corporate retreat. Custom built in wall of rich wood cabinets. Custom light and fan fixtures throughout. Cozy courtyard nooks for privacy. French doors and mirrored closet doors. Huge custom walk in closet in the master suite. Please call us to set an appointment for your private tour. You will love the elegance and luxurious atmosphere at Casa la Buena Vida. Sunsets beyond compare await you. • 9,759 sq. ft., 9 bath, 11 bdrm single story "Modern With Ocean Views" - MLS $1,395,000 - Beach Front home!! None, Las Conchas - A pristine beachfront hacienda style home located in the popular Las Conchas community meticulously maintained showing pride of ownership is one of a kind and is on the market. The amazing home consists of 11 bedrooms and 10 full bathrooms and 2 half bathrooms, plus a Studio Apartment. Sitting on 3 beachfront lots and expanding 200 feet in length you will have incredible see forever views. With 2 complete living quarters the whole family can enjoy it. Being totally renovated to resemble a true Mexican hacienda in rich Mexican colors its move in ready. You enter the hacienda through a set of massive wood doors; with a welcoming courtyard and 10 foot canter fountain to greet you. The courtyard is surrounded by the bedroom suites. The kitchen/dining room face the majestic Sea of Cortez with a dining room table seating 20 plus a breakfast bar seating 4 or you can sit outside on one of the unique patio’s sipping a margarita or delicious latte watching the dolphins swim by. The property s set up for weddings, family re-unions. Corporate retreats, large gatherings and more. The hacienda is presently the premier rental property in Rocky Point and has all the qualities to provide a magical experience for every age. CASH, OWNER WILL CARRY WITH A LARGE DOWN PAYMENT. Please call us to arrange your private tour of this pristine beachfront hacienda. Whale Hill, Puerto Penasco/Rocky Point - ONE OF A KIND on Whale Hill with amazing panoramic views to the sea this beautiful home is waiting for you. Close to 7,000 sq. ft of quality in every room; you feel the pride of ownership everywhere you look. You’ll love entertaining in your dream home by the sea. The GREAT room features are unique in every way (view the photos and you’ll say WOW). With a stone fireplace and views beyond words it’s so easy to entertain from your horseshoe-shaped bar and formal dining area. This exquisite home could be a fantastic BED and BREAKFAST with 3 living areas, 5 bedrooms and 7 baths. See below for additional features and call to make an appointment for your private tour. You will not believe your eyes when you see the charm, character and comfort of this ONE OF A KIND home in Rocky Point, Mexico. It is a dream home through and through! Features include, custom paint, custom bathroom decor, custom murals, custom hand-carved woodwork, custom tile through-out, custom gourmet kitchen is a chefs dream, custom beamed ceilings and light fixtures, custom window features and the list goes on. 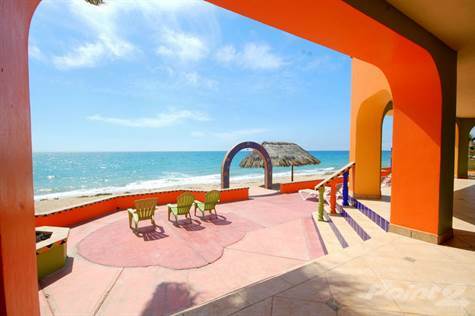 Las Conchas, Puerto Penasco/Rocky Point - Located in the popular Las Conchas of Rocky Point just listed this beautiful 3 bed and 3 bath beach front home. With amazing layout from the moment you walk in the door you know this is a home where memories are made. Large kitchen over looking the living area with 2 master suites up front it is hard not to see what is and what can be. Come view this oustanding home! With inventory for beachfront down, this being such a great layout combined with popular location of Section 3 this is a real value.